The mother of a US man who died protecting two young women from anti-Muslim harassment has called him "a hero" who "will remain a hero" after his death. 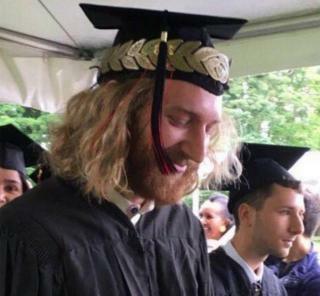 Taliesin Myrddin Namkai-Meche was one of two men who were stabbed to death on a train on Friday in Portland, Oregon. Police named the other man who died as Ricky John Best, 53, a father of four and an Army veteran. Another passenger was wounded before the attacker was arrested. Police have identified the suspect as Jeremy Joseph Christian, 35, a convicted felon. He is due to appear in court on Tuesday, charged with two counts of aggravated murder, attempted murder, intimidation and being a felon in possession of a restricted weapon. However, Loren Cannon, special agent in charge of the Federal Bureau of Investigation in Oregon, said on Saturday it was too early to tell whether the "violence was an act of domestic terrorism or a federal hate crime". On Friday afternoon, two teenage girls, one of them Muslim and wearing a headscarf, boarded a train in Portland. According to witnesses, they attracted the attention of Mr Christian. Dyjuana Hudson - mother to one of the girls - said he began "saying all Muslims should die". Sergeant Pete Simpson confirmed the "suspect was on the train and he was yelling and ranting and raving a lot of different things, including what would be characterised as hate speech or biased language". Three men then stepped in to help the girls. Ms Hudson told the Oregonian that one of them said: "You can't get at them like that — they're little girls." Media captionPortland mayor: "Violent words can lead to violent acts"
But the suspect then allegedly turned on the girls' defenders. Sgt Simpson said: "Some of the people that he was yelling at, they were attacked viciously by the suspect, resulting in the two deaths and one injury." Apparently unaware of how badly injured their defenders were, the two terrified girls fled, calling Ms Hudson for help. Mr Christian was arrested shortly after he got off the train. Mr Best was on his way home when he was attacked. He had spent 23 years serving in the US Army, retiring in 2012, according to the Oregon website Willamette Week. Since 2015, he had worked for the City of Portland. His colleague Kareen Perkins told Oregon Live he was "the first person you would go to for help". Mr Namkai-Meche was on the phone to his aunt when the suspect confronted the girls. Mr Namkai-Meche's aunt urged the economics graduate to get off the phone and film what was happening, KATU News reported. "I didn't mean for him to try to be a hero and get himself killed but he was trying to protect those two teenage girls," she told the television station. Mr Namkai-Meche's mother paid tribute to her "dear baby boy" on Facebook. "He was a hero and will remain a hero on the other side of the veil," she wrote. "Shining bright star I love you forever." Ms Hudson, the mother of one of the girls, wrote on Facebook: "Thank you thank you thank you... You will always be our hero." The injured victim, Micah David-Cole Fletcher, remains in hospital. 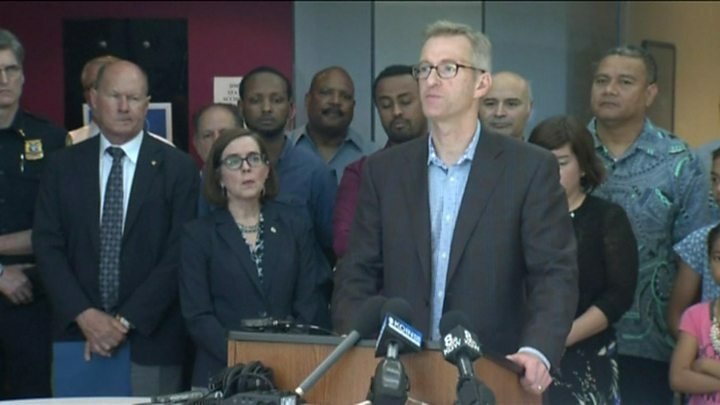 Portland mayor Ted Wheeler said the "brave and selfless actions" of the three men "should serve as an example and inspiration to us all". However, speaking at a press conference, he warned "the current political climate allows far too much room for those who spread bigotry". Who is the alleged attacker? A senior researcher with the Southern Poverty Law Center, a hate-attack monitoring group, said Mr Christian's Facebook page said he held "some racist and other extremist beliefs". His Facebook page also said he liked "comix" and "cannabis". An article in a Portland local alternative publication reported that he was a "known white supremacist" who had previously given a Nazi salute at a right-wing march. The police have declined to share details of his criminal history.